Kim Washburn has been writing for children for more than ten years. While working at Focus on the Family, two of her original stories were recognized by the Evangelical Press Association, including first place in the fiction category. Her nonfiction books for young readers have reached a wide audience―including Breaking Through by Grace: The Bono Story and Defender of Faith: The Mike Fisher Story. 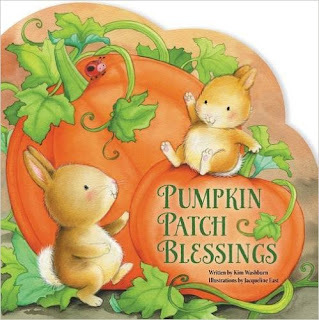 Pumpkin Patch Blessings by Kim Washburn is an adorable cute children's board book! I absolutely love fall so my family and I go all out. Pumpkin Patch Blessings is the perfect way to celebrates fall by teaching kids about the blessings that are all around us, especially in the pumpkin patch. I love the rhyming text throughout this book as well as the beautiful illustrations. My kids have been asking to read this book before bed for the last few days and after reading they always ask about visiting our local pumpkin patch because it's something we do each year. I love seeing them get excited about fall but more importantly I love seeing them recognize the blessings of the fall season and remembering to be thankful for all that God has given us. Pumpkin Patch Blessings is a wonderful way to kickoff the upcoming fall season! You can find Pumpkin Patch Blessings by Kim Washburn on Amazon, Zondervan, Barnes and Noble and other bookstores.